International and national guidelines recommend low-molecular-weight heparin for the treatment of venous thromboembolism (VTE) in patients with cancer. The aim of the Caravaggio study is to assess whether oral apixaban is non-inferior to subcutaneous dalteparin for the treatment of acute proximal deep vein thrombosis and/or pulmonary embolism in patients with cancer. The study is an investigator-initiated, multi-national, prospective, randomized, open-label with blind end-point evaluation (PROBE), non-inferiority clinical trial (NCT03045406). Consecutive patients are randomized to receive oral apixaban or subcutaneous dalteparin for 6 months. Apixaban is given at a dose of 10 mg twice daily for the first 7 days and then 5 mg twice daily; dalteparin is given at a dose of 200 IU/kg for the first month and then 150 IU/kg once daily. The primary outcome of the study is objectively confirmed recurrent VTE as assessed by a central independent adjudication committee unaware of study treatment allocation. The primary safety outcome is major bleeding defined according to the guidelines of the International Society of Thrombosis and Haemostasis. Assuming a 6-month incidence of the primary outcome of 7% with dalteparin and an upper limit of the two-sided 95% confidence interval of the hazard ratio below the pre-specified margin of 2.00, 1,168 patients will be randomized considering an up to 20% loss in total patient-years (β = 80%; α one-sided = 0.025). 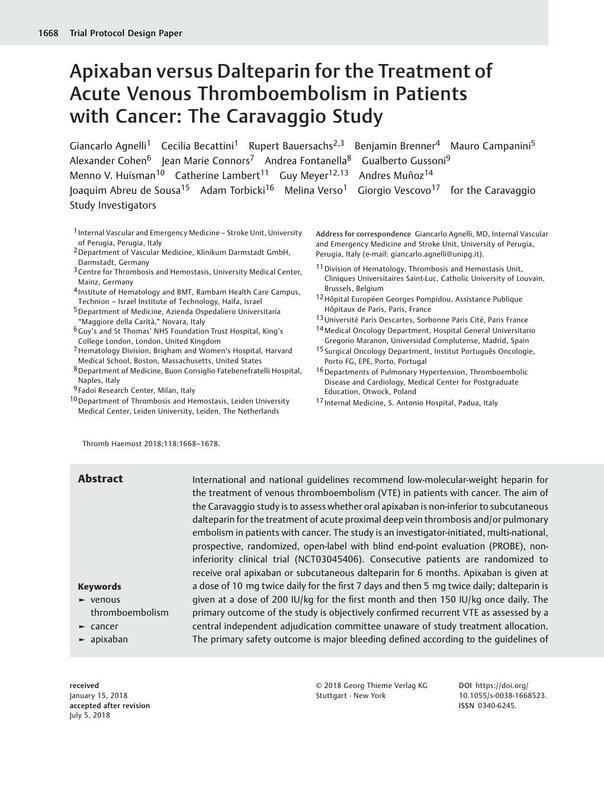 The Caravaggio study has the potential, along with other recently performed or on-going studies, to make less cumbersome the management of VTE in patients with cancer by replacing parenteral with oral anticoagulation.